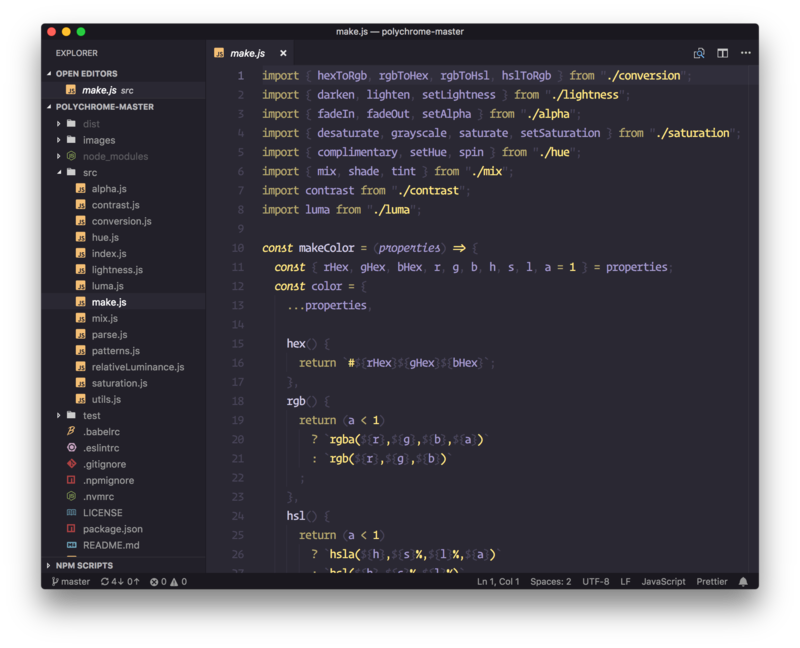 Visual Studio Code>Themes>Polychrome themesNew to Visual Studio Code? Get it now. Generated Duotone themes using polychrome for your entire workbench! 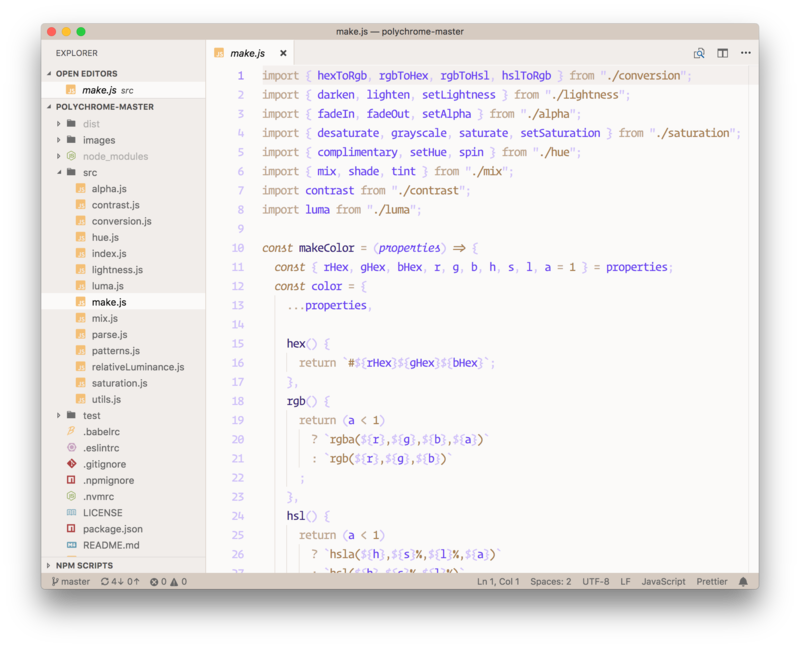 Inspired by the work done by @simurai and the creation of duotone themes for Atom. Again, these are the base themes. You can modify the light and dark theme values in User Settings to your liking to create a custom duotone theme of your own ( See below in Extension Settings). You can also head over to the Polychrome Theme Viewer to try out different color combinations before updating your user settings. You simply provide a background, primary, and accent color. After that, the extension generates a duotone theme that contains shades and tints of your chosen colors. When the theme is updated through the extensions view, there is a chance that your theme colors will reset if you have modified the dark or light settings for the theme. If you find that this is the case, simply run Polychrome: Generate Dark/Light Themes from the command palette. This command will use the user settings values and regenerate your theme files. I hope to work with the VS Code team to add some sort of :onupdate hook that can run for extensions needing to do any local cleanup when an update happens. polychrome.dark.primary: This serves as a base for the dark theme and is mixed with white and the background color to create 2 tints and 2 shades for a total of 5 primary colors. polychrome.dark.accent: Brightest accent color for the dark theme. 2 additional accent shades are created by mixing with the background color for 3 total accent colors. polychrome.dark.background: Determines the base editor background color for the dark theme. This value is then darkened/lightened throughout the UI where appropriate. polychrome.light.primary: This serves as a base for the light theme and is mixed with black and the background color to create 2 tints and 2 shades for a total of 5 primary colors. polychrome.light.accent: Darkest accent color used for the light theme. 2 additional accent shades are created by mixing with the background color for 3 total accent colors. polychrome.light.background: Determines the base editor background color for the light theme. This value is then darkened/lightened throughout the UI where appropriate.